We deliver as complete binding including shell & liner, thick liner plus €12, XXL plus €36 for the longer plate. In snow skiing one does not see many leather boots any more, why? The plastic hard shell delivers a more accurate and direct controll over your ski. Same applies to water skiing. You will need five sets to adapt and then be able to harvest the fruits of your investment - you will get a few buoys more. The thin liner allows the best and most direct guidance of your ski, because there is less material between your foot and the hard shell. It is the favorite liner of top level skiers. Skiers with bigger, wider or high instep feet prefer thin liners because they feel less compressed. The thick liner is designed for thin feet. Or you are just slightly above the cut for one size. In general recommended for ladies and juniors.Focuses on comfort with thick pads at the buckle and and Achilles tendon locations. how to choose your correct size? pls stand up, put your naked heel against a wall and measure from the wall to the tip of your big toe - if the length of your foot is e.g. 26,4 cm please choose size 27,5 cm . If the hard shell is a little bigger - that´s no problem, if too short then it`s no good for you! the white upper cuff has a softer torsional flex to release pressure on your leg above the ankle, providing a better performance, more accuracy and comfort. The lateral flex remains the same. you may limit the forward flex of the upper cuff to get more pressure on the front end of the ski in your preturn. You can set the stop of the forward flex at different points e.g. at 5°, 7°, 9° or no stop for trick. Some skiers like to combine it with a Wiley rear binding. Die cuts and sewings have been optimized for a better flex forward and backward. Ventilated foam : water evacuates, the binding remains light, reactive and comfortable. I just started competing in tournaments, is the Reflex binding good for me? 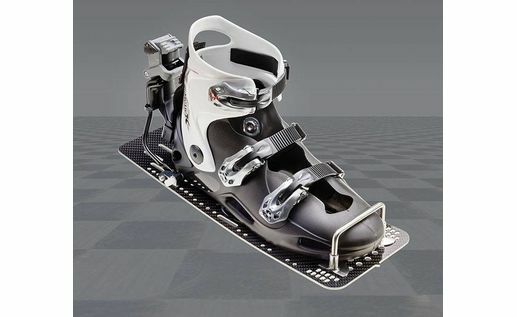 The Reflex system is especially well suited for novice skiers because when comparing it with rubber bindings it only has advantages, no disadvantages. Greater comfort, thus more passes for the skier. Security in release from falls. How much do I have to weigh before I can start using the Reflex hardshell? One using the Reflex system should not weigh less than 88 pounds [40 kilos]. This is because even when the release mechanism is set at the minimum number it still may not release. What are the advantages versus rubber bindings? The Reflex system provides many advantages for both slalom and trick skiers. These advantages have convinced many high level skiers around the world to abandon their rubber bindings for the Reflex hardshell. Your shoe size is not the most reliable method to determine your hardshell size. We recommend that you measure the exact length of your foot. The best way to do this is to stand and place the heel of your foot against a wall, then measure from the heel to the end of the front toe. Is the Reflex binding compatible with all the skis on the market? There are 2 standard settings used for the inserts of skis on the market today. Both our aluminum and carbon plates are adapted to fit both these insert settings. Also, because of our long slots on our plates it makes it easy to adjust the plate forward or backward on the ski. 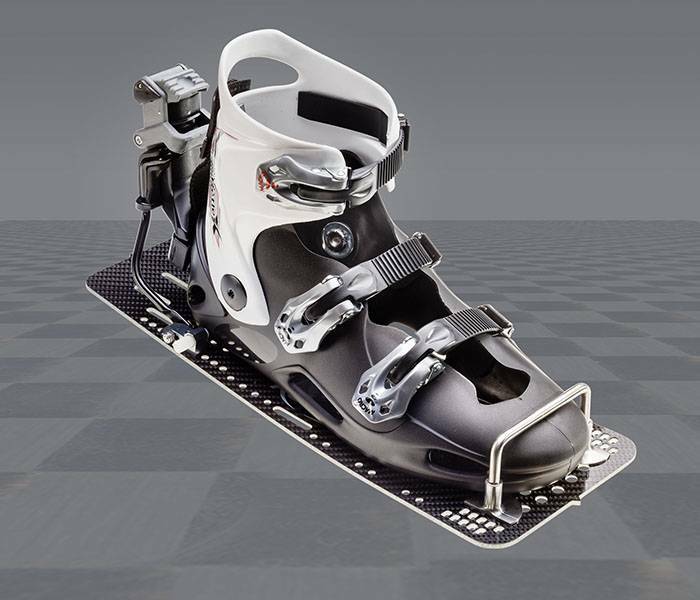 For skis without inserts Reflex offers and ingenious solution, “REFLEXBONDS”. How do I set the release mechanism? The release mechanism operates from a spring. You set the tension of this spring from a screw on the release. The setting of this spring is determined not only by the weight of the skier but also by the skier’s level of skiing. Thus a beginner skier will have a lower number on their setting than a seasoned competitor. How do I maintain my Reflex system? The release mechanism should be rinsed on a regular basis to remove any debris. You should check to be sure that all screws are tight on the release system before each set. There should be no movement between the release system and the hardshell, nor between the hardshell and the front toe horseshoe. It needs to have a snug fit to be effective. There is possibility that with time the system could loosen so then you may need to move the release forward one hole. Due to the fact that the certain components of the system will last longer than others, it is possible to purchase certain components of the Reflex system separately. Can I make any modifications? We at Reflex are constantly testing and improving our products. We do not recommend that you make any kind of modifications to our system. This could have hazardous results. To modify the height of the hardshell, it will result in a change in the response of the release mechanism. To use another hardshell with our system, other than the Reflex hardshell. The rigidity of the Reflex hardshell is critical in the performance of the release mechanism. We also discourage the use of non Reflex thick liners with the Reflex release system. This could result in a delay in the release system opening. The Reflex carbon plates offer several advantages over the aluminum plates. Some skis are delivered without inserts. It is not recommended to cut or drill carbon fiber which will compromise the structure and the performance of the ski. Reflexbond glue was invented for the use in the assembly of helicopter parts. These bonds will preserve the flex of your ski for a longer period and they will aid in avoiding ski breakage.